Broc. Cheese. Bacon. With the start of fall upon us, this soup hits all the right spots. Fry bacon in the Dutch oven until browned, add the diced onion, crushed garlic, and the pepper flakes, and fry until translucent - about 8 minutes. This step is optional, based on your preferred texture. We like some pieces of broccoli still present, so we blend the soup only a little bit. But if you want it completely smooth, either use a stick blender or transfer the soup into a blender and blitz until completely smooth. Add salt and pepper to adjust to your taste and serve! With the fall season fast approaching, even though you wouldn’t know it with the heat wave we are experiencing, it’s time to cook soups again. This recipe is my wife’s creation and since it is absolutely delicious, I don’t want to rob you of the chance to make it for yourselves. Amazingly simple and relatively quick to make, this soup is rich, delicious, filling, and perfect for the fall. The broccoli provides a nice contrast to the richness of the cheese and together it is nicely balanced by the chicken stock and cream. 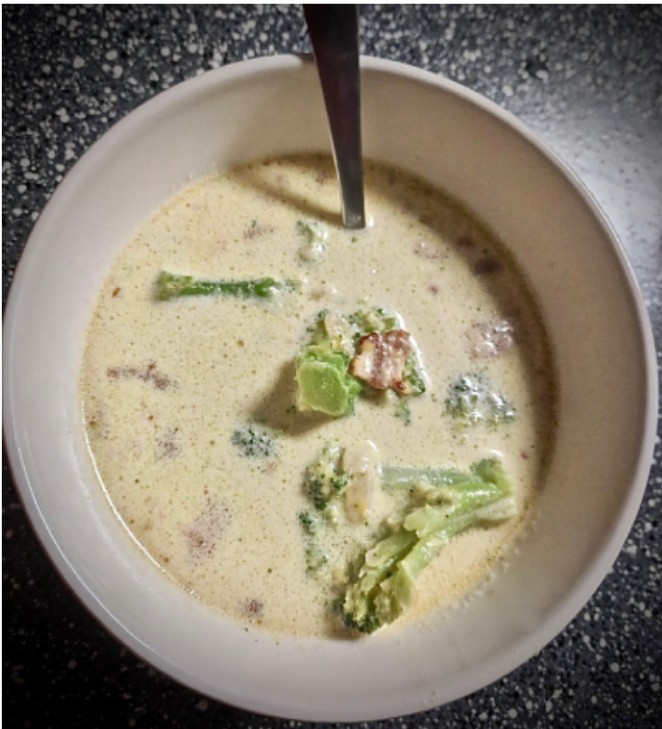 This is not your typical thick cheesy soup, but instead a nice mix of yummy broth and fresh broccoli that is guaranteed to fill you up. Enjoy!